How is it June already? This can only mean that it’s almost summer and time to bring out the bunting. In just under a month a very special person will be celebrating a milestone birthday. We all love a good party now and again and what better excuse to celebrate this milestone than with a Street party. Street parties are a great way to get to know your fellow neighbours a bit better, improve community spirit and have a fun day right on your doorstep – what’s not to like? You can get everyone involved including the kids. Throwing a party is easier than you might think. You can spread the load across willing residents and arrange informal get-togethers to prepare for the party, making the planning stage much more enjoyable. It’s all about the right ingredients – you can’t beat good food, old friends, new faces, bad jokes and great conversation. 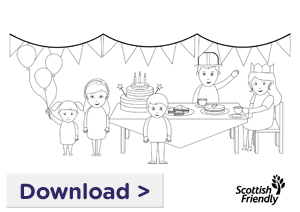 So whether you’re planning a street party or even a totally tea-riffic garden party there are plenty of ideas and tips online, for example The Street Party Site to help ensure your party is fit for a queen without having to cost a fortune. To celebrate all things British right now, Scottish Friendly is running an online competition where we are giving away a selection of Gruffalo soft toys. There are 6 popular characters from Julia Donaldson’s marvellous book series including the Gruffalo himself as well as the mouse, the squirrel, the owl, the fox and the snake (all shown above).